The Ronnie Scott nine piece band, the Tubby Hayes eight piece and the Johnny Dankworth Seven were at the forefront of the modern jazz movement in the U.K. at the beginning of the Fifties. The personnel of the Scott band were made up mostly of players led by Ronnie Scott resigned from the Jack Parnell Orchestra over a dispute over the sacking of tenor player Pete King who was later to become Ronnie Scott’s partner when he opened his club. The band had a nucleus of players who were some of the U.Ks top players in the modern field. Victor Feldman was to become and International name when he moved to work in the United States. Derek Humble was to become one of the best lead alto players in the business leading the saxophone section in the Clarke / Boland Big Band and Tony Crombie was to lead his own small band. On the first twelve tracks the full band tracks are interspersed with smaller groups from within the band. The final seven consist of Ronnie Scott with a quartet which includes three alternative takes. 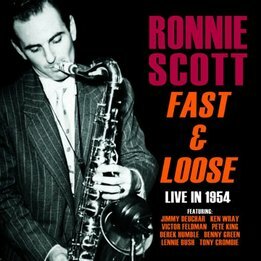 The album gets off to a rousing start with a Ronnie Scott composition “Fast and Loose” which is a two tenor chase with Ronnie and Pete King spurred on by Tony Crombie’s enthusiastic drumming. “Body Beautiful” one of Tony Crombie’s lightly swinging numbers with stunning solos by Derek Humble and Jimmy Deuchar. Ronnie’s ballad talents are on display on “Laura” which has some excellent piano playing by Victor Feldman an indication of things to come. “I Wished on the Moon” is a chance for Derek Humble and Jimmy Deuchar to display their solo creativity and they take full advantage. The final quartet tracks demonstrate what a creative player player he was, the nothing of great significance between the alternative takes although “Sunshine on a Dull Day” is taken at a slightly slower tempo and Victor Feldman’s piano solo on take three is a cracker. The master take on “Fools Rush In” has a little to much echo and take one sunds much better and the piano sound is much improved. The first twelve tracks were recorded on location and were pretty good for the period and are a good indication of what the band sounded like at the time. The Quartet tracks are an opportunity to hear Ronnie at length as there is not a lot of recordings available mostly due to Ronnie’s reluctance to record. Recommended as an example of what was happening in British jazz during this period.